Start after start, Webb put his head down and went to work. I was on the couch, home early from work, when Brandon Webb took the mound in Chase Field against the Rockies on Opening Day 2009. There had been reports out of Spring Training that he was feeling some discomfort and would be pitching at less than 100 percent, but that hardly seemed concerning. For a pitcher who wasn’t yet 30 and had been the picture of consistency for three seasons running, it was assumed (by me, at least) that he would be fine in the long run. Gibson was a badass upon arrival in Los Angeles in 1988. Interim managers are rarely given a true chance to succeed. For starters, they typically only become interim managers because their team was bad enough to warrant the firing of the first manager. And managers can only make so much difference to a team; a good manager knows how to handle the different personalities in the clubhouse, juggle a bullpen and stay out of the way. A bad manager will try much too hard to influence the direction of the game, will lose the respect of his players and create an untenable situation. According to the team, it’s not hard to see why they were let go. They were in last place, three years removed from 90 wins and an NLCS appearance, and the minor league system had dried up. I think letting Byrnes go was a bit much, since the failings of the club this season had more to do with a historically bad bullpen — their 6.89 ERA is mind boggling — and the absence of Brandon Webb from the rotation, leaving Dan Haren as their only real stud, than a failing baseball model. Byrnes will get scooped up by another team as soon as he wants to be, I’m sure. All this brings us to his replacement, the by-all-accounts fiery Kirk Gibson, who has been the bench coach for the past five years, playing bad cop to good cops Melvin and Hinch. When Melvin was let go last summer, it was just as surprising that Gibson didn’t get the job as it was that Hinch did. Following the Diamondbacks as closely as I did, his style was obvious. He coached like he played, with an edge that showed that he hated losing more than he actually enjoyed winning. Where Melvin was calm and reserved, Gibson was screaming from the dugout, getting in players’ faces, and demanding constant effort at all times. His takeover of the team, Arizona hopes, could mirror his arrival in Los Angeles from Detroit in 1988. 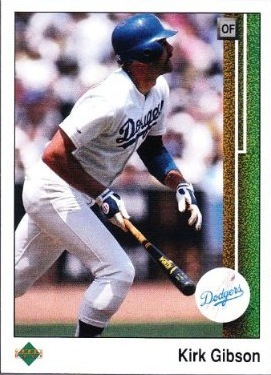 In his first run with free agency, Gibson signed with the Dodgers, who had finished 73-89 in 1987, good for fourth in the division. Most folks know the story from here: Gibson went on to hit .290 with 25 home runs and an .860 OPS, which was half the reason he won the MVP. The other half was that edge that fans and sportswriters like so much, that General Patton, win-at-all-costs attitude. The Dodgers rode Gibson and the best year of Orel Hershiser’s life to 94 wins, the West, the pennant and the World Series. And Gibson hit a famous home run you may have have seen once or twice. He had left the Tigers to sign as a free agent and didn’t like what he saw in Dodgertown: the joking around, the “clowns coming out of trunks” and, finally, the last straw when a teammate lathered the inside of his cap with “eye black.” That wasn’t the way he approached the game. He told them he devoted everything to the serious business of winning. Winning, he said, was fun. That’s basically what Arizona is looking for here Turning Byrnes and Hinch loose was a gutsy move, and I’m not convinced it was the right one. But I’m pulling for Gibson, and in turn, pulling for the Diamondbacks to show some kind of life through the rest of 2010. 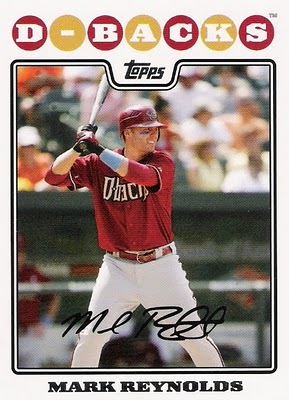 Mark Reynolds. So many home runs, so many strikeouts. It’s been a rough year for my adopted National League team. Lost for me amid the April home run escapades of Mark Reynolds and Kelly Johnson was the fact that the Arizona Diamondbacks can’t seem to win a game. Which, of course, is what baseball teams would prefer to do, typically. Backtracking a bit, I moved to Arizona at the end of 2006, and started going to see the Diamondbacks at Chase Field (just a few minutes from my house) pretty regularly at the start of the 2007 season. Tickets were cheap (you can sit in the third level for $5) parking was cheap or outright free if you arrived early enough, and most importantly, they were a fun team to watch. Eric Byrnes was the face of the team and having his best season, and he was a blast. Galloping in left field with his blond hair flopping out the edges of his cap, he would chat with fans sitting in left field, steal bases with reckless abandon (he stole 50 that year) and even hosted “The Eric Byrnes Show” on cable, where you could see him doing things like working out with the NFL’s Cardinals, going shopping for a barbecue or setting up his teammates on dates. There was more, of course. Brandon Webb was practically unhittable, finishing second in the Cy Young voting the year after winning it. Orlando Hudson was having another gold-glove caliber year at second base and made the All-Star team, and youngsters Chris Young, Justin Upton and Mark Reynolds came onto the scene and made an impact. They blooped their way to the top of the division and even knocked out the Cubs in the Division Series before they surrendered to the Colorado Rockies in the NLCS. A hell of a first year to watch them if there ever was one. In 2008, they regressed back to the mean slightly, and last year was a full three steps back for the Diamondbacks, for sure. They finished with a record of 70-92, last in the National League West, and fired Bob Melvin (NL Manager of the Year in 2007) in May, replacing him with newcomer A.J. Hinch, who immediately got into disputes with many of the veterans on the team. Eric Byrnes was released at the end of the season, Hudson was allowed to walk before it, and Webb never threw a pitch after opening day. And it doesn’t take more than a casual glance to see that this year isn’t any better. At 28-43, only the Pittsburgh Pirates are worse in the Senior Circuit. Dan Haren has looked rather mortal, with his 4.71 ERA and 1.332 WHIP. Webb still hasn’t thrown a pitch. Baseball Reference notes today that at -0.9, they’re almost a full run worse than the average team day-in and day-out. And despite the home run exploits of Reynolds and Upton, they’ve already struck out 100 and 92 times, respectfully. Even for Reynolds, who has set major league records in strikeouts the past two seasons, that’s a bit much. There is some hope. Yesterday, they managed to beat up the Yankees to the tune of 10-3, and that was nice. Rodrigo Lopez struck out two over eight innings, Upton homered twice, and Reynolds and Adam LaRoche each added another. But, it close to over for me. I’m back on the other side of the country, and the attachment I felt to the team came from seeing them every weekend they were home, and they’re hardly ever on TV now. I’m pulling for them to snap out of this, either this year or the next, but win or lose, it’s going to be a passive kind of support from here on out.